Adam Oates played 19 seasons in the National Hockey League (NHL) for the Detroit Red Wings, St. Louis Blues, Boston Bruins, Washington Capitals, Philadelphia Flyers, Mighty Ducks of Anaheim and Edmonton Oilers. Known as an elite playmaker, his career total of 1,079 assists was the fifth highest total in NHL history at the time of his 2004 retirement. He played in five All-Star Games. He holds the record for most points all-time of any NHL player who also played NCAA Hockey. Oates was inducted into the Hockey Hall of Fame on November 12, 2012 along with Joe Sakic, Pavel Bure, and Mats Sundin. 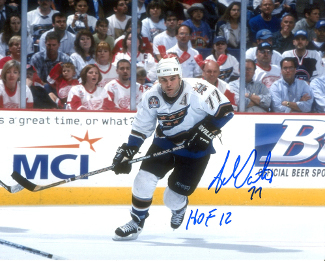 Adam Oates has hand signed this Washington Capitals 8x10 Photo with HOF 12 inscription. Tri-Star Hologram and Certificate of Authenticity from Athlon Sports.